We call my dad 20-pot-Pete because when he cooks, I swear he uses every item in the kitchen. 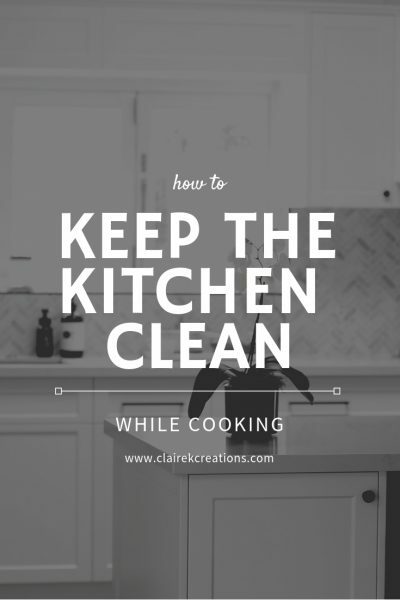 Now I’m not going to claim to be the neatest cook but I do like to keep a reasonably clean kitchen while I’m preparing meals (although sometimes I think my husband disagrees). 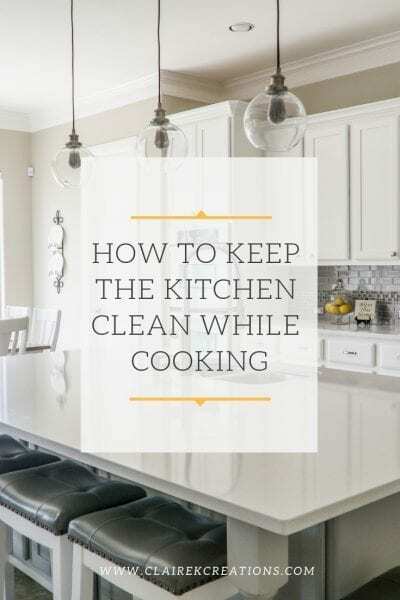 Cleaning as you go is a good way to stop the mess spreading too far. We have a double sink so usually, as I cook I will rinse things in one side of the sink and throw them in the other then once I’m finished, I’ll stack the dishwasher. 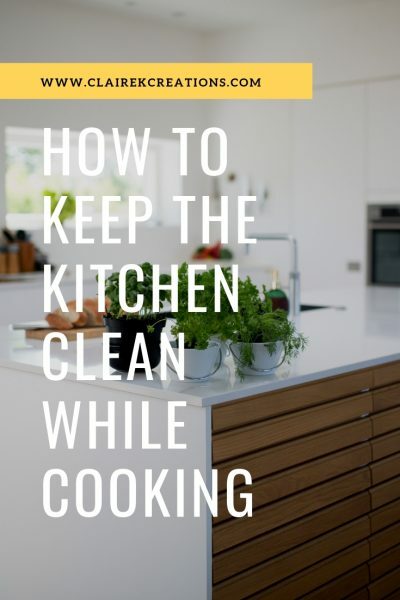 This method ensures stuff doesn’t pile up around the kitchen and there’s always some clear bench space. 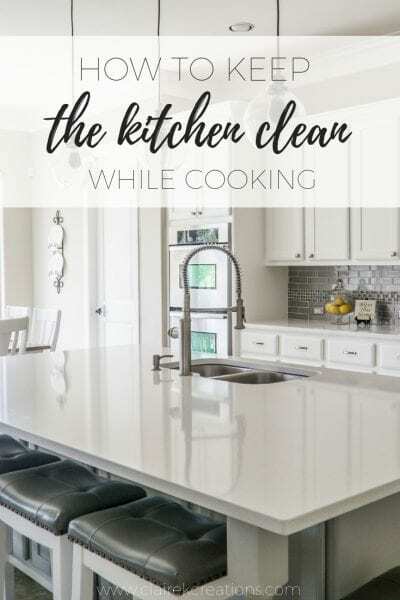 You might also be interested in how to keep your kitchen bench clean. I like to think in disaster terms. 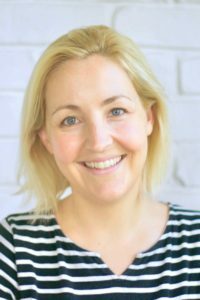 I have kids so it’s not completely unlikely that something might happen in the blink of an eye and I have to run out the door. I don’t want to come home to a disaster so that’s why cleaning up like that as I go is high on my list. My usual method is to put away all the ingredients first. As I use them I generally try to put things away but if there is anything left, I collect all the cold things and pop them back in the fridge then all the pantry items go back to their homes too. My husband doesn’t love this step but the next thing I do it throw everything into the sink (anything I haven’t already rinsed and put in the sink). I rinse on one side and then throw it into the other side of the sink. For me I find it much easier to do the dishwasher packing in one big go. I know this sounds rather uptight but this way I get to assess it all, see what will actually fit and then decide what I need to handwash rather than putting a big pot in, realising I have no room for all the plates then having to take it out again to hand wash.
You might also be interested in how to keep the kids kitchen stuff under control. Then I wipe down the bench and then spray and wipe it over with my homemade all-purpose spray. This is where I actually do the dishwasher stacking. I have a bit of a look at what needs to be washed and how it will fit then set aside anything that needs to be hand washed. I stack the dishwasher, quickly wash up and dry the hand wash items and put them away. If you want to take it one step further. Doing things like bulk meal prep not only saves you time and money but it cuts down on the cleaning. Peeling carrots? Peel a whole stack of them, cut them up and pop them in a tupperware container with a little water and there’s no more carrot prep for the week. I try to do this with all my veggies so there’s only one lot of vege prep each week. If you want to take it yet another step further, prepare more than one meal at a time. 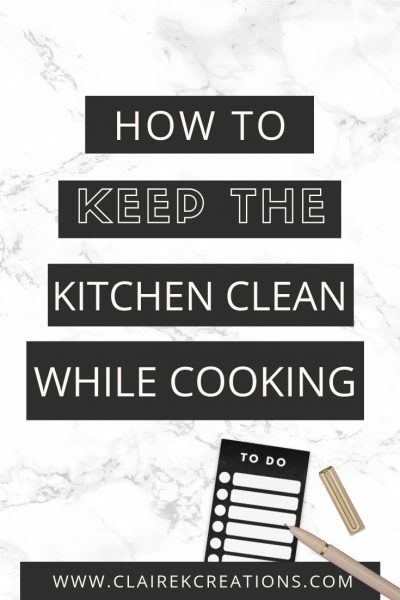 Sure you might make a little more mess than cooking one meal but then the next night, zero mess. 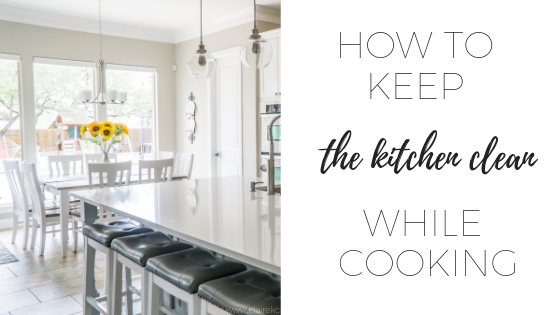 Maybe you put something in the slow cooker and prepare another meal for the oven? I always ask myself, ‘what can I do now that will make my life a little easier later’? 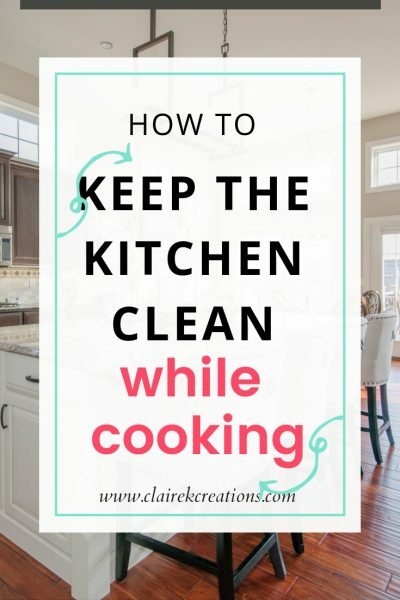 I hope some of these tips can help make cooking a little cleaner and your life in the kitchen a little less stressful. 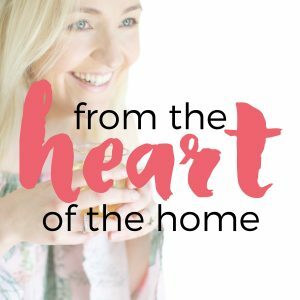 If you’d like to make dinner times a little easier I’d love to offer you a free copy of my eBook 11 recipes, 12 ingredients – learn how to create a basic ingredient supply in your kitchen so that you can cook easy, tasty meals even when cooking is the last thing you feel like doing (without having to run to the shops). Click here to download your free copy.